As stated before, the superhero team that Josh Tobey and I created was an assembly of four characters (the fourth of which will be redesigned next week), of whom Josh and I divided creative responsibilities right down the middle. 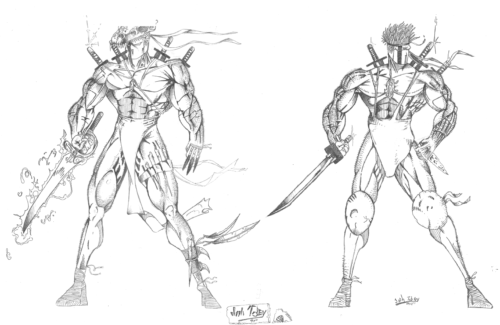 To that team, Josh brought the character of Katana, whom he had created previously. Katana, I want to say, was one of the earliest creations of our years-long collaboration, a power fantasy of Josh’s devising whose story and history became as complicated and nebulous as any published superhero. An immortal human sent back in time to stop an alien invasion, Katana basically embodied everything that Josh and I liked during our teenage years. 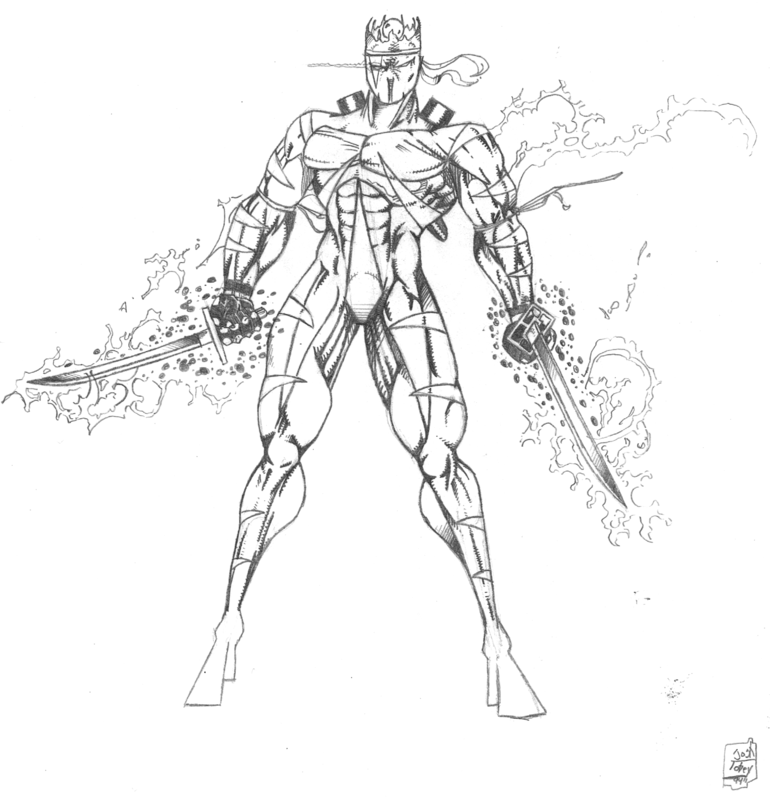 In terms of comics, I think he was most inspired by Todd McFarlane’s Spawn for Image Comics, if only because that character spanned centuries as well and providing ourselves the opportunity to design century period-appropriate costumes for the character was enticing. Josh has been watching me redesign these old characters and was energized by the efforts. When I kind of ran out of my characters to redesign (almost), I asked if he didn’t mind me redesigning characters he created for the superhero team. He didn’t mind at all. 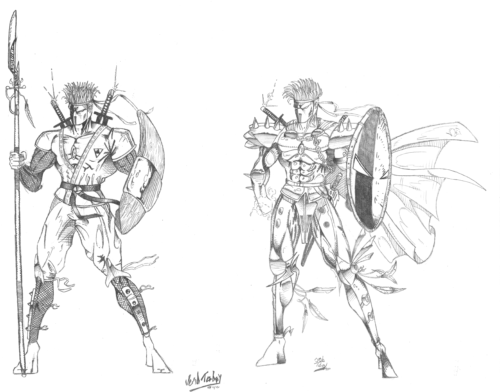 However, it was followed by e-mails containing his redesigns of his characters which I demanded to share (especially as I’m elbow-deep in grading at the moment). What is most energizing is that we both approached these characters’ redesigns on our own terms without consulting each other, so our respective interpretations are wholly unique and indicative of our current aesthetic mindsets. More than anything, it’s just fun to see what two people whose creative lives were so intertwined as teenagers would do at this point over twenty years later. I started with the mask because that was a big part of his identity back in the day. Instead of a hockey mask glued to his face (he didn’t eat, by the way)––I didn’t want to go back to that––I figured that he wears a mask to take impact but also to hide what his face really looks like. The eyes are now more of an optical aide, perhaps fish eye view, infared, zoom, etc. As for the rest of him, he is based on some of the old Chinese martial artists that would go into an establishment and kick all the bad guys’ asses and not need a gun. He can go into a situation light and stealthy, mess stuff up, and ideally get out in one piece. The armor is light to take some blows but not overwhelming. His suit might be made of a material that camouflages him and might be tough to cut/puncture, possibly made of a carbon nano structure that could stop a bullet and maybe dull a sharp object or not rip or puncture. After all, he is supposed to be a character from the future. His weapon of choice is a katana, go figure. His might be a different alloy but that is what he does his damage with. What his write-up highlights between the two of us is the fact that we both focused on the mask first, the character’s defining feature. More importantly, we both took different angles on it. Perhaps it highlights our divergent paths as artists, but it shows, at the very least, how independently-minded we remain after starting at, basically, the same place. It makes sense that we spent so much time focusing on his mask, as it was the one constant throughout his development. Josh had been drawing for a long while before I ever put pencil to paper. He was my mentor and guide and silent combatant. I always measured my ability against his and always came up short. After all of this time, I think some of that remains, but I’m also mature enough to recognize that we have become very different artists in our maturity and exist on very different planes currently, though we are forever linked through these early creations. 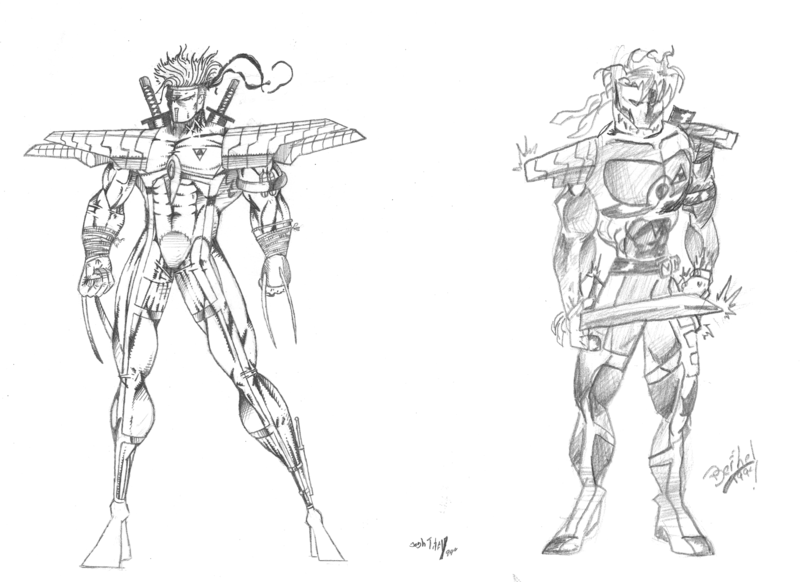 Showing the difference in abilities in 1994, Josh’s Katana is on the left, Dan’s is on the right. The one thing Josh nailed thoroughly on the head in his teens was the idea of being able to render drawings clearly and tightly. His drawings always looked finished and, thusly, became a goal I strived for and still never really feel like I achieve. So, partly as revenge, partly as an earnest endeavor to chronicle our humble history, I submit drawings Josh made over twenty years ago of Katana through the ages. Stone Age Katanas. Art by Josh Tobey, 1994. Ancient Japan Katana (left), medieval Katana (right). 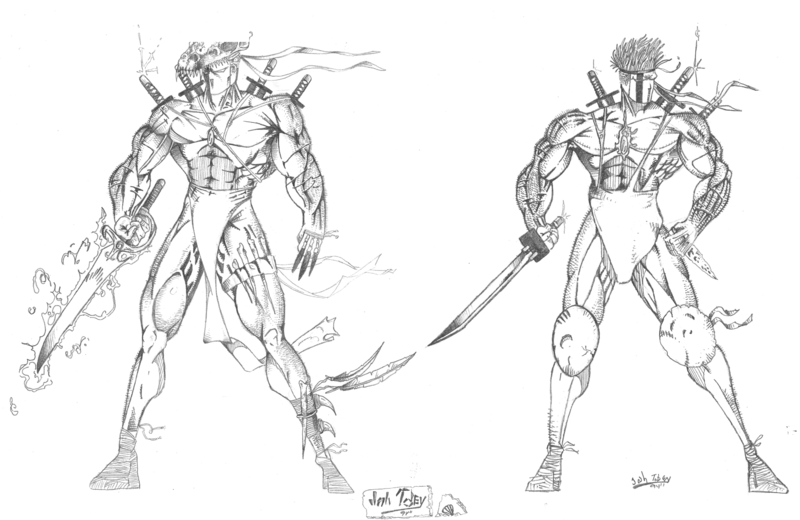 Totally not influenced by Todd McFarlane’s Spawn in the slightest. Art by Josh Tobey from 1994. I don’t post these to merely embarrass Josh. Instead, they are mile markers in my own development. 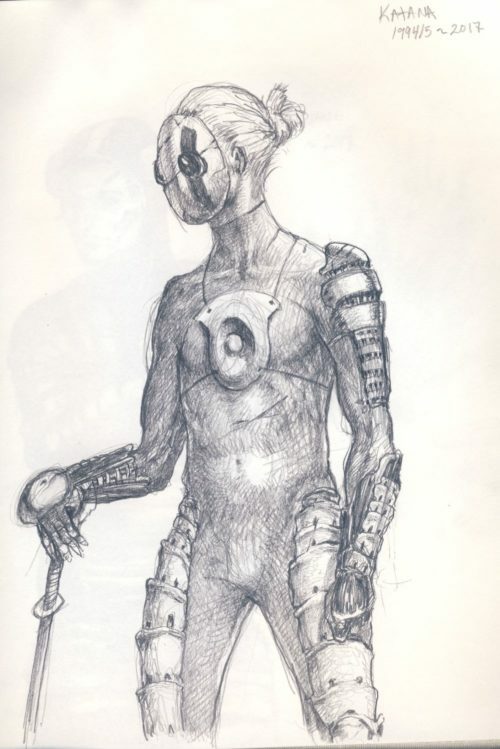 When I first saw these, I had no idea how he drew images that looked so final and finished, establishing, if not an aesthetic, then at least a benchark I still strive for. Until this day, I want my drawings to look “done” and, I must admit, it only rarely happens. So, to an extent, I’m still chasing the arbitrary and unknown goal posts that Josh’s incredible talent as a 15 year-old planted in my impressionable psyche.